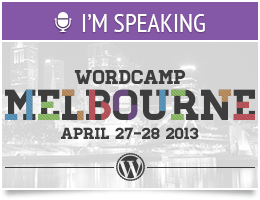 I’m excited to announce (again) that I’ll be speaking at WordCamp Melbourne on April 27-28. The title of my talk is WordPress 101 and I’ll be the first speaker on the Blogger & User Track. This is my first trip to Australia and I think it’s gonna be a great time. Looking forward to meeting at the WP folks in Melbourne!